After the computer and DAW, arguably the most important component of any studio is the audio interface. It may seem like spending a fortune is the only way to get the best digital recording and playback quality. However, “you get what you pay for” need not always apply. Many smaller studios are taking advantage of USB audio interfaces for their I/O needs with fantastic results. Even some of the most affordable options can supply 24-bit/192 kHz quality, which is as good as it gets! We’ll examine a handful of the best USB audio interfaces for home/project studios on a budget, when simple I/O is all that’s necessary. A USB interface with 2 to 4 inputs and monitor outs does the trick and does it well. Among the following selections are a set of uniform features you’ll find in any audio interface. Keeping the budget-friendly small home studio in mind, at the very least, sub-$300 units carry a single XLR input/preamp, +48V phantom power, stereo TRS outs, and a 1/4″ headphone input. In most cases, single preamp interfaces also have a dedicated 1/4″ line input technically making them 2-in/2-out devices. Some of the selected interfaces are more feature-rich than others, so do a little bit of homework and choose what best suites your studio! 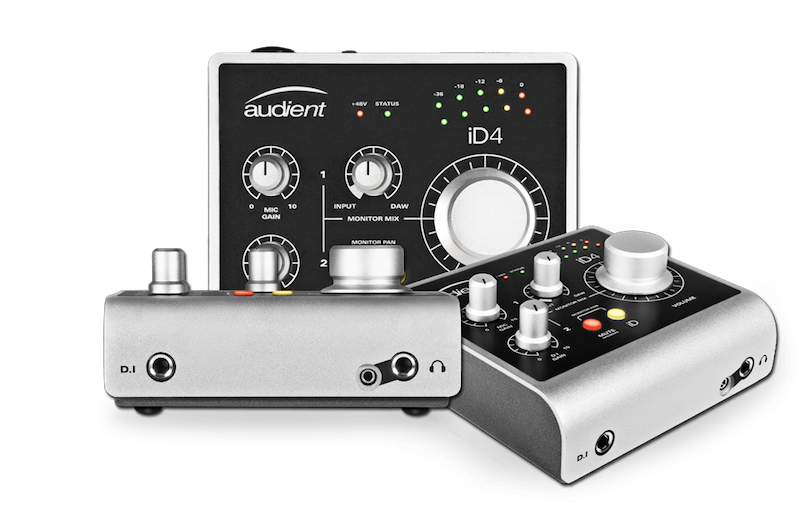 The Audient iD4 is a 2-in/2-out interface with a single mic preamp and instrument input. The available inputs can be used to track vocals and a line-level instrument simultaneously, for example. Operating at 24-bit/96 kHz, the iD4 is a compact, high-quality interface at an inexpensive price point. Audient uses the same Class-A mic preamp in their entire product range, from full-format consoles to the simple iD4. This interface is a good shout for a home studio that has minimal I/O needs, without sacrificing recording quality. Ultra-portable devices like those in IK Multimedia’s iRig range are frequently overlooked as interfaces competitive with desktop counterparts. However, the iRig Pro Duo is a full-featured interface in spite of its small footprint. The 2-in/2-out unit houses dual XLR/TRS hybrid inputs with studio-quality IK preamps, and two balanced TRS outs are onboard for monitor connections. Even though it can fit in your hand, the Pro Duo has all of the features of much larger interfaces, including +48V phantom power, MIDI I/O, and 24-bit converters. This is obviously an ideal choice if portability is a concern, but even sat on a desk, the iRig Pro Duo performs like a much larger beast. Steinberg’s UR22 interface is a phenomenal choice if 192 kHz support is on the checklist. The UR22 sports two hybrid mic/line inputs with D-Pre[amps], 5-pin MIDI I/O, and two TRS line outs for monitoring. Input 2 also has a Hi-Z switch specifically designed for tracking high impedance instruments (like guitars) direct. It all comes housed in a rugged metal chassis, so tossing it into a backpack definitely won’t hurt if you travel and record often. As its name suggests, the Scarlett 2i2 is one of the most popular 2-in/2-out USB audio interfaces on the market. Focusrite touts the 2i2’s latency as being the lowest of any competitor, and its streamlined, no-nonsense design make it a solid choice for basic home set-ups. Sure, “streamlined” might be interpreted as “featureless” by some, but the device’s two hybrid mic/line inputs and TRS outs can handle typical assignments with ease. Another with impressive 24-bit/192 kHz support, the M-Audio M-Track 2×2 is a fantastic interface when utmost quality is desired. The 2×2 interface has a single hybrid mic/line input and a 1/4″ instrument input, with standard TRS outs. Additionally, a feature overlooked by competitors is the M-Track’s “future-proof” design. That’s right: the M-Track is USB-C supported! If you’re using a new laptop and tired of the “dongle life,” the M-Track 2×2 is a perfect choice. Inspired by Mackie’s flagship Onyx-i series mixers, the Blackjack is a 2×2 USB interface with some of the best preamps and AD/DA converters in the price range. Onyx mic pres are found in Mackie’s high-end consoles, but a pair were fitted to the Blackjack at a reasonable cost. The interface also carries Cirrus Logic converters for 114dB of dynamic range. Apart from preamp and converter quality, the Blackjack is more or less a no-frills piece of hardware. You might notice, though, that it was built at a 25-degree incline for comfortable accessibility on a tabletop. Ergonomic design aside, the Onyx Blackjack is relatively barebones. The largest and most versatile of the USB audio interfaces described here is the Akai EIE Pro. It’s a 4-in/4-out device with 24-bit recording quality up to 96 kHz. An amazing feature of the EIE pro is the addition of 3 extra USB ports, allowing it to function as a USB hub as well. The analogue-style VU meters on the front are a nod to non-digital technology and a nice stylistic touch. For greater functionally, each of the 4 inputs has a channel insert for connecting outboard signal processors, too. In this way, the EIE Pro functions similarly to a mixer. There are, of course, a plethora of other great USB interfaces not mentioned here. This is merely a sampling of what’s out there for a $300-maximum budget. Best of luck on the quest for the perfect USB audio interface for your project studio!